Where Are The Joneses? is a new. Er. I'm not sure what it is. I don't think there's a word for it. To make a good word you'd have to bang together all sorts of unpleasant jargon; UGC, social media, branded content, things like that. But whatever the word is, it's fascinating stuff, and we all need to learn from it. Let's start with a rough explanation. Where Are The Joneses? is a web-based improvised road-movie sit-com that's updated at least daily, partly written by its viewers (readers? users?) and delivered to people across a vast slew of social media stuff - twitter, MySpace, YouTube, Facebook, dawdlr, the list goes on. But it's not just that. It's also sponsored by Ford. You could look at it as one long Ford ad. So what should it make us thing about? Firstly - it was conceived of by Imagination. We all know them, we all admire them. But a lot of you are thinking - aren't they an events company, good and everything, but don't they mostly do big tents? Well no, and even if they did, we're now in a world of best idea wins and anyone with the talent and the willing can do this kind of thing, doesn't have to be the agency, doesn't have to be the digital agency. Just has to be somebody good. Secondly, Where Are The Joneses? is all over the place. There isn't a single, main, medium. People are receving it in whatever way makes sense to them. Its creators aren't bleating about media fragmentation they're basking in the opportunities it gives them, using every tool they can think of. More significantly they're surrendering ownership of it to encourage re-use; everything there is under a Creative Commons license which means that the programmers viewers can remix and remake it to their heart's content. This means that everyone's experience of WATJ will be different and probably 'incomplete' in the traditional sense, it means that viewers (I'm going to stick with viewers) will have to bring their own meaning to the story, they'll have to do some work themselves. I suspect this will lead to a smaller audience, but deeper involvement. It'd be interesting to think about what's more important. Thirdly, Ford has a very light touch involvement with this - they've got a sponsorship button and they're providing a car. So light that you might wonder what they're getting out of it all. Until you think about how much they're learning. About their audience, their agencies, about the changing face of sponsorship, about the legal implications of remixing content, about all sorts. Because, put simply, they've done this and you haven't. 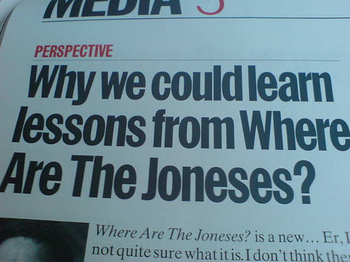 Have a look at www.wherearethejoneses.com and read a thoughtful review at bowblog.com. Jett - could you define what you mean as 'good' or what you are refering to as 'it'? I this you nailed it this. "I suspect this will lead to a smaller audience, but deeper involvement." Many advertisers are still scared of this statement, and it'll take a LONG time to change. I recently did a call with an agency who told me that Publisher sites has to be careful about doing TOO much audience targeting / segmentation because otherwise they might end up with incredibly targeted ads but only 30 impressions and there's no way anyone will pay for that. Smaller audience, yes, but if the audience are the opinion formers then job's a good 'un! Incidentally Bausola, Where are the Jonses is excellent, it's really funny. And a lovely move by Ford. Every ad angency be kacking it's breeks at what Imagination has done. I wondered what that smell was.